Metro is a fast-operating, easy-to-learn high-powered sequencer for the design of professional audio projects. It stands alone as a complete and integrated MIDI, audio and video production system. The audio system supports up to 64 audio tracks. Each track can have its own effect chain. Eight aux busses are also supported. Each with their own chain. Chains can be made up of VST effects and/or AudioUnits (OS X only). VST 2.0 is supported. All effects can be automated. Real-time editing is encouraged. Software audio play-thru allows the original audio to be recorded regardless of what plug-ins are currently in use. The MIDI system has been around since the 1980's and is the most versatile and stable product of its kind on any platform. 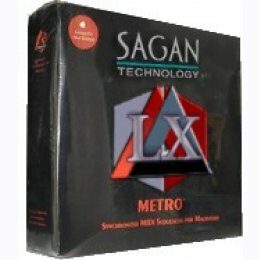 Metro combines all the functionality expected from a professional Macintosh MIDI sequencer with a simplified interface and innovative ideas, such as the Rhythm Explorer™ and the algorithmic Note Spray Paint tool.This MIDI system has been updated to support CoreMIDI and VST technologies. The video system uses Apple's QuickTime technology for recording, applying video effects and overlaying text. Complex projects can now be completed simply and elegantly. 16 Sections with up to 48 tracks per section. Up to 10 audio tracks and 2 aux busses. Up to 10 audio effects or 3 synthesizer type plug-ins (soft-synths). AudioUnit (OS X) and VST 2.0 Support. Convert synthesizer plug-in output to audio simply by mixing tracks. Jukebox for playing MP3, and many other file types. Audio file compression with QuickTime. VU meters for monitoring of audio and MIDI. Record at variable sampling rates up to 96kHz and sample sizes up to 16 bit. Edit and process with sample accuracy. Apply audio effects in real-time and make off-line edits. Drag and drop editing of audio regions. Stereo mix-downs at variable sampling rates up to 96kHz and sample sizes up to 16 bit. Step record, punch in-out, loop record, sound on sound record, and multi-take MIDI record modes. Edit audio, MIDI notes, controllers, tempo, audio volume, audio pan, aux buss send volume, aux buss send pan, pitch bend and drum patterns within a single time-locked window. Fade and automate volume, pan and other data. Pitch bend and transpose notes. Record, edit and insert SysEx data. Multiple time/key signatures per song. Import and export audio using QuickTime. MIDI file import and export (types 0, 1 and 2). Experiment and apply different rhythms in real-time with the Rhythm Explorer™*. Paint a musical canvas with the Note Spray tool. Note Pad for keeping notes on individual files. And more! *Metro LX has a limited selection of algorithms in Rhythm Explorer.